Manchester City is facing Tottenham in the 2nd leg game of the Champions League. The first leg game was interesting even though the Spurs managed to score only one goal. But City has their home fans as an advantage now. If this will do the trick will be shown. In our betting tip, we expect Guardiola and his team to win with a handicap. The home game was lost closely but this is not over yet. Especially since the Cityzens are allowed to compete in their own stadium. In four home games on the international stage the fans were able to celebrate at least six goals in two of these games. Guardiola’s team can wear down the opponents with their style of play. In the Premier League ManCity already shot 55 goals in front of home crowd and the expected goals are almost exploding. The coaching staff is able to heal almost all of the teams injury, so we dare to get a handicap bet with strong odds in our betting tip. The success in the Champions league was a nice experience, especially since it could be achieved in the new stadium. However, the return leg is a completely different game. Tottenham is not in the shape of the first leg win. In the league, only one of the youngest five games could be won. Much worse, however, weighs the injuries. Attacking again could be the two immensely important players Alli and Kane. Especially in the case of Kane it is a bitter loss, because the striker hunched most of the hits of his team. Without the two, the game of Spurs lost an important element, so we dare to bet on a handicap bet against the Spurs. If Manchester City manages to win the 2nd leg game in their own stadium and wins by at least two goals, the odds range from 1.75 to 1.85. If Guardiola’s team wins with just one goal difference, the betting odds range from 3.70 to 4.50. In case of a a draw or a victory of Spurs, bookmakers distribute sports betting odds from 3.36 to 3.70. Our betting tip: The shape of the Spurs is mixed and with the possible failures of Kane and Alli, the Spurs just lost two key players. In addition, City has proven to destroy the opponents on the field, especially in their own stadium. That’s why we expect a handicap victory of the Cityzens. Here you can find the odds Manchester City vs. Tottenham Hotspurs. 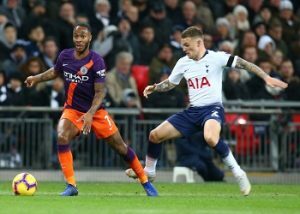 This entry was posted in UEFA Champions League and tagged Manchester City vs. Tottenham Hotspur Odds comparison, Odds Manchester City vs. Tottenham Hotspur, UCL Bets. Bookmark the permalink.